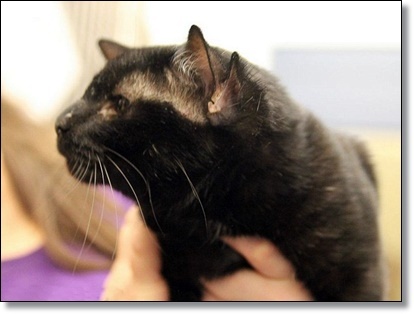 The black feline with a rarely seen genetic mutation was cared for by the Humane Society in Western Pennsylvania for a month before his new owner adopted him. The three-year-old cat with an extra set of ears is not the first of its kind. The genetic mutation has been documented as far back as 1938 in Ashtabula, Ohio, with a four-eared cat named Toots. “The mutation has been studied and is argued to be a recessive gene mutation needed from both parents in order to produce four ears,” the charity said. 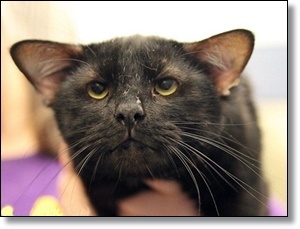 Batman was unavailable for adoption when he first came into the shelter because he was being treated for an upper respiratory infection. But on Tuesday, the shelter posted a video advert of him on Facebook. “Batman would do well in a house with or without animals as he came from a house with several animals. He is a very friendly and love cheek rubs,” Hala Nuemah, managing director of the Western PA Humane Society, wrote. Shelter veterinarian Dr Todd Blauvelt told CBS News: “He's a really cool cat. He's really nice. Really affectionate. He has a very rare congenital defect. It doesn't really affect his hearing. He can hear just fine,” he explained. Within a few hours he was snapped up by a young girl and her mother who gave him a permanent home. “It was perfect because the little girl liked superheroes,” Caitlin Lasky, marketing communications manager for the Humane Society, told ABC News.